Osprey's Talon 11 gets three key daypack requirements exactly right. It's light, it's (relatively) cool against your back, and it's structured enough to carry loads well. On that third point, I'd say the frameless Talon 11 is easily the best ultralight speed/endurance day pack I've ever used. You don't expect an 11-liter backpack to nail its load to your hips, but that's exactly what the Talon 11 does. The Talon has a corrugated semi-rigid framesheet (as part of its "airspace" design) that gives the pack a surprising amount of structure. Add the wraparound mesh hip straps, and you can easily adjust the Talon 11 to carry weight on your hips instead of your shoulders. Given we're talking about an 11 liter pack, that may sound like a pointless perk, but trust me, it's not. 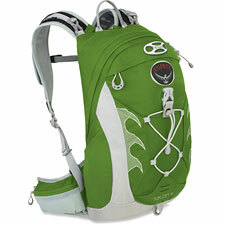 The Talon shines as a desert endurance backpack where carrying large water loads is mandatory. If you love the size and comfort of an ultralight endurance pack but hate the feeling of two or three liters of water dragging on your shoulders all day, the Talon 11 was made for you. Alternately, if you tend to carry heavy camera gear and not much else, the Talon 11 will comfortably manage a full-frame DSLR and lens or two. Obviously, the catch here is that you're not getting a lot of usable volume. Eleven liters will let you pack in water plus food plus a first aid kit and shell—but not much else. You can stick two skinny (0.5L) water bottles on the exterior sides via stretch pockets, and you can strap a fleece to the outside via an included x-crossing bungee cord, but realistically you're quickly going to run out of room as your equipment needs grow. Osprey has included a helmet attachment point plus two exterior zip mesh pockets on the waistband, plus mesh pockets on the shoulder straps to hold your energy goo packs, so the Talon 11 does tilt toward the bells-n-whistles end of the spectrum. Inside is a main compartment plus two zip pouches. There is also a hidden exterior pocket for your hydration bladder or miscellaneous stuff. As seems inevitable with Osprey packs, we get undeniably quirky straps, buckles, and zippers. My simple test for zip annoyance is whether or not I can operate zippers with one hand. The Talon 11 fails that test, and even as time passes and you adjust to the Talon's zippers, you may still wonder (as I do) why Osprey made the zippers so much more complicated than necessary. Maybe it's something in the water in Cortez. The bottom line for me is I'll take the lousy zippers and goofy buckles if you'll keep the weight off my shoulders, and with the Talon 11, it's a done deal. Add in the comfort and coolness of a fully-functional airspace back panel, and the Talon is an easy choice for endurance desert hikers, and Alpine day trippers who carry a lot of weight but not a lot of bulk.